This has just come in from Tony Graham, highly respected children’s theatre practitioner, former director of Unicorn Theatre and TAG, and thoroughly good egg. I saw this show last October at a school in Coventry as part of a festival celebrating the 50th anniversary of Belgrade Theatre’s Theatre-in-Education (TIE). The aim of the festival was to programme contemporary work that honoured the principles of TIE while acknowledging the changes that had taken place over fifty years. ‘The Boy Who Bit Picasso’ tells the true story of how the young Antony Penrose met and, indeed, bit Picasso. The biting happened during a bout of lively play-acting when the artist was playing at bullfighting with his young friend. Picasso was a friend of Roland Penrose, the surrealist painter, and his wife, Lee Miller, a famous photographer. Antony’s mother, Lee Miller, is a key role in the play. One of the endearing things about this play is the way that there is no fanfare or suggestion that we are in the presence of Famous People. It’s just life on the farm. We see things through the eyes of young Antony, a curious, playful young boy. As far as he’s concerned, there’s nothing especially unusual about his family or their artistic friends. He is perfectly placed to both question and understand the offbeat artistic imagery and behaviour of this bohemian milieu. The child’s eye view and Picasso’s unorthodox art come together in a telling blend of innocent enquiry. The play validates the child’s perspective and, at the same time, helps us to see how ‘the child’ in Picasso’s art can lead to a reframing of the way we see reality. It is a great introduction to the idea of surrealism – but equally the play helps us to see the world in the way that an artist might see and reconstruct it. The subject of the play transcends the relationship between the boy and the artist and, ultimately, becomes a meditation on art itself. 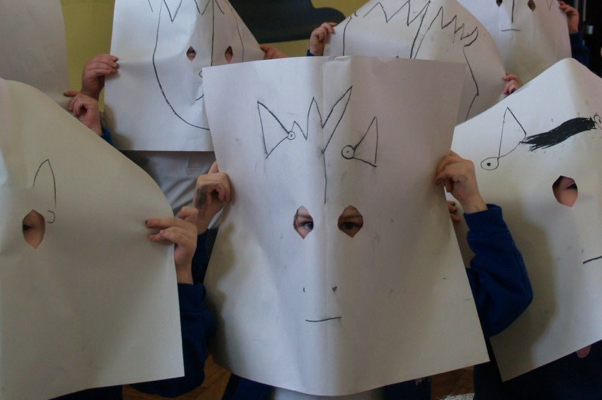 At every step of the play, the company directly involve the audience in a series of delightful activities that encourage the children to make their own (surrealist) art through mask-making and some lovely messy art-making. These never feel forced or extraneous. In the spirit of TIE, this participatory work is woven into the fabric of the whole theatre experience. This touring production is at times dream-like without ever losing its clearly delineated narrative. It doesn’t aim to ’teach’ anything. Maybe because of this, it gives rise to all manner of educational possibilities. One of the support teachers who saw it at the performance I attended was beside herself with the way it ignited the children’s imaginations and encouraged further explorations. The company draws on a number of theatrical streams familiar from the contemporary world of non-linear, physical, visually-led theatre making. The tone is warm; the audience felt welcome and supported every step of the way. It honours and respects the young audience’s intelligence. And, in case it’s not obvious, the show is a delight from start to end and has its own distinct identity. Like the art it explores, it is helping us to see things anew through fresh eyes.